The backscene is very simply made, being nothing more than 2mm thick plywood cut to size and joined at the corners with aluminium angle. This I stuck on using 'No Nails' adhesive and so far it has proved a strong joint, although I did roughen the surface of the aluminium with sandpaper to improve the grip! 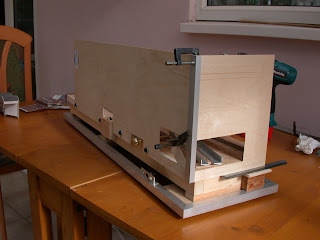 The backscene is attached to the baseboard by screws in slots so that it can be easily removed by slackening the screws and lifting it away from the layout. 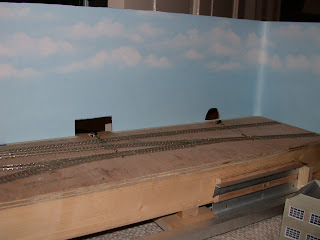 I cut access holes for the point operating switches and also the train table, this later one proved to be impossible to use so it is now redundant. One thing I hate about model railway backscenes is sharp corners or joints that are apparent on so many layouts. Well I don't have any joints as I only have one baseboard so that was a good start. The corners were easy to disguise by sticking a quadrant moulding into them. This is a plastic moulding I got from a local DIY store and again 'No Nails' was the adhesive of choice. 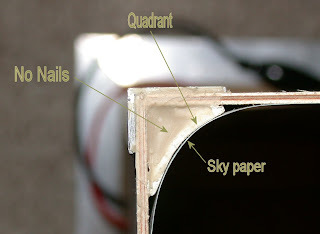 My only concern was that the edge of the quadrant has a thickness, about 1.5mm, which could show as a line on the backscene, this has not proved to be a problem. I have used PECO sky paper which is stuck on with spray photo mount adhesive. I used this as I did not want a 'wet' adhesive which might soak through or stain the front. Two lengths of paper where needed so the paper join will be hidden by the strategic location of a tall chimney. I have yet to devise a solution to protecting the edge of the paper as there is the ever present risk of catching it and tearing the paper. I am pleased with the effect and am now considering whether or not to add some backscene buildings from the Townscene range or just stick with the 3D buildings on the layout!